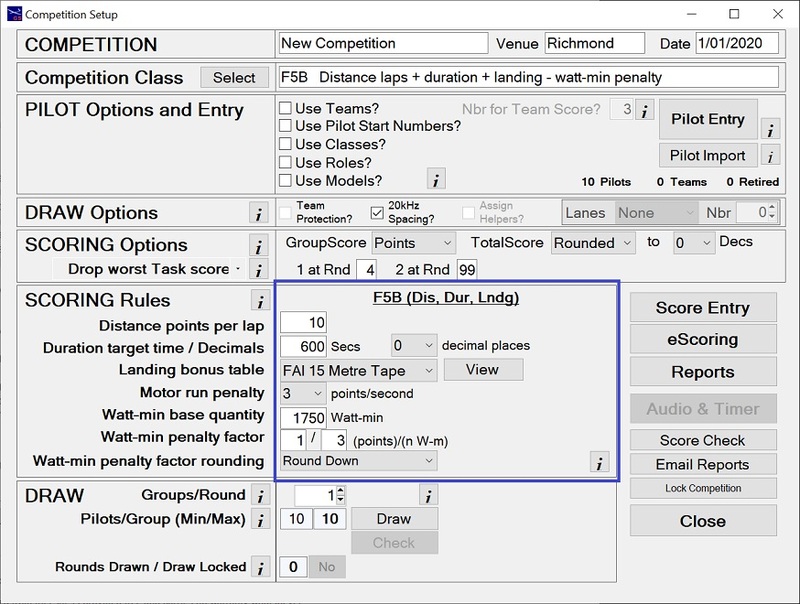 GliderScore integrates all aspects necessary to setup and run an F5B competition. GliderScore complies with all aspects of the 2016 FAI F5B rules. Unlimited number of pilots. Up to 99 rounds can be drawn. Unlimited number of Landing Bonus tables. The draw separates pilots in the order based on same frequency and/or same team. Pilots can be 'retired' and a re-draw made with the remaining pilots for later rounds. A group can be split into two, and split again if necessary. Whole groups can be re-flown. New re-flight groups can be 'built' with selected pilots. Deducts drop scores at predetermined number of rounds flown. Deducts penalties from the final score. Allows for one or two timekeepers. If two, times are averaged (but if one time entered, averaging does not occur). Provides a comprehensive suite of reports. All reports can be previewed, printed or downloaded. Score cards can be printed from the Reports menu. Multiple competitions can be selected into a Competition Series and a series Championship report automatically produced. Expand F5B on the side menu to work through these features. When entering scores, enter the excess number of Watt-minutes used. The system calculates the penalty points according to the selections made. Watch the Comp Setup F5B video. Software downloaded from this site is provided free and carries no warranty whatsoever.